The Oppo Find 7 has officially been unveiled, and as was the case with the Find 5 and the N1 before it, Oppo has aimed to push the boundaries once again with its latest flagship smartphone, with the premier version featuring a Quad HD display. Competing in the phablet segment, it’ll be very interesting to see how the Find 7 compares to the Samsung device that currently dominates this market. 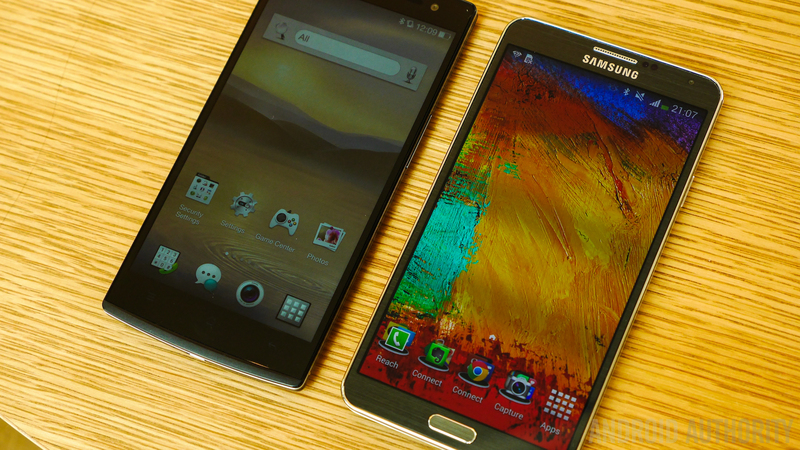 Here’s a quick look at the Oppo Find 7 vs Samsung Galaxy Note 3! There are two very different design philosophies at work here, with the smooth and rounded lines of the Galaxy Note 3 contrasting with the more angular design of the Find 7. Like it’s predecessor, the Oppo Find 5, the Find 7 features a minimalist look with a premium feel, without too many embellishments. The premium version of this device comes with a carbon fiber back panel with a woven pattern, reminiscent of the Motorola Droid line, while the Galaxy Note 3 offers an equally nice feel in the hand, with the welcome move away from glossy plastic to the faux leather plastic material. The front of the Find 7 is all black and distraction free, with no logos or physical buttons to draw attention away from the beautiful display. While the display of the Galaxy Note 3 shines through as well, you do get the signature button layout at the front, with a physical home button flanked by two capacitive keys. On its flat sides, the Find 7 features two sleek faux chrome rings, while the Note 3 uses the same material to mimic the pages of a notebook. Even though the Galaxy Note 3 features a display that is slightly larger, the dimensions of both devices are quite similar. the Oppo Find 7 is a millimeter taller, but is noticeably narrower, making the latter a little easier to hold. The Galaxy Note 3 is almost a millimeter thinner though, with the 3 grams difference in weight negligible. The premium version of the Find 7 takes the lead in a display comparison, at least, if pixel density is of paramount importance to you. The 5.5-inch screen features a resolution of 2560 x 1440 (Quad HD), resulting in a whopping pixel density of 538 ppi. On the other hand is the Samsung Galaxy Note 3, that comes with a 5.7-inch display with a resolution of “just” 1080p, translating to a pixel density of 386 ppi. While not many will care or particularly notice the contrast in sharpness, the difference certainly exists. As for the technologies underlying the screens of the two contenders, we have a beautiful IPS LCD (Low Temperature Polysilicone) display on the Find 7, with the Galaxy Note 3 featuring a vivid Super AMOLED screen. The Oppo Find 7 has a slight advantage over the Galaxy Note 3 with its upgraded quad-core Qualcomm Snapdragon 801 processor, clocked at 2.5 GHz. This is the same processor that powers the Samsung Galaxy S5 and the Sony Xperia Z2, so the Find 7 is certainly in elite company. Along with the Adreno 330 and 3 GB of RAM, the processing package of the Find 7 is the best that is currently available. The Samsung Galaxy Note 3 also comes with 3 GB of RAM and the Adreno 330 GPU, with the SoC being the older 2.3 Ghz quad-core Qualcomm Snapdragon 800 processor. In theory, the biggest difference between the two processing packages is the slightly higher speeds of the CPU, GPU, and memory interface. Either way, performance is going to be lightning fast, with both smartphones ably handling anything you can throw at it. Both devices come with all the bells and whistles you’d expect from a current high-end Android smartphone. The Find 7 does come with expandable memory, an option not available with the Find 5 or the N1, and can accommodate the newly launched 128 GB microSD cards, as opposed to the 64 GB max of the Galaxy Note 3. Both phones have large batteries that are also removable, but even without needing to replace the battery, you should be still be able to get more than a full day of usage from both. The Find 7 comes with a 3,000 mAh battery, while the Galaxy Note 3 manages to squeeze in a larger 3,200 mAh unit into a sleeker body. That being said, the Oppo Find 7 comes with a special fast-charging technology that, according to Oppo, makes it best-in-class. You should be able to charge the Find 7 from zero to 75 percent in just 30 minutes, with a 5 minute charge giving you almost 2 hours of talk time, which is absolutely amazing in a pinch. The 13 MP Sony Exmor RS sensor of the Find 7 is combined with a 6 part lens and powerful software features, one of which is called Super Zoom, which combines 10 images taken at the same time to create one 50 MP image with a lot of detail. On the front, you get a 5 MP camera with a wide lens, that allows for an 80 degree field of view. Both cameras have 2.0 aperture lenses, which is great for low-light photography for obtaining the blurred background effect that we all love. It’s a very promising setup that we’re looking forward to putting through its paces. Of course, the Samsung Galaxy Note 3 holds its own in this department, with its great 13 MP rear shooter, which also coupled with tons of software features. The Find 7 runs Android 4.3 Jelly Bean, which is somewhat disappointing as we’d have expected a current Android smartphone release to feature Android 4.4 Kitkat. You get Oppo’s Color OS on top, with a similar implementation to what is found on the N1, as opposed to uber cheerful version of the Find 5. Additions include support for various gestures, as well as a range of widgets, and other small enhancements. You get the well-known TouchWiz on the Samsung Galaxy Note 3, on top of Android 4.3 Jelly Bean. Samsung is rolling out Android 4.4 to the Note 3 currently, which will introduce small design changes, along with some Kitkat specific functionality. 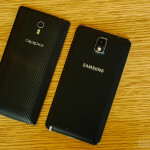 While the Samsung Galaxy Note 3 is still an amazing choice, the latest flagship from Oppo has a lot to offer, not only by virtue of it being a newer release, allowing for an updated processing package, but with its Quad HD display and what should be fantastic camera, there’s a lot to get excited about when it comes to the Oppo Find 7. What are your thoughts? How do you think the premium version of the Oppo Find 7 does against the Galaxy Note 3? Let us know in the comments section below!